Anna Marrs is the head of Standard Chartered’s Commercial and Private Banking Clients divisions globally. In this role she leads the bank’s mid-sized corporate banking and high net worth individual businesses in 20 markets in Asia, Africa and the Middle East. 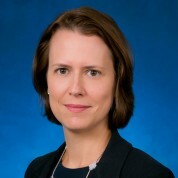 Anna joined Standard Chartered Bank as Group Head of Strategy and Corporate Development in January 2012. While the Head of Strategy, Anna led the development of the strategy for Goal, a programme aimed at empowering adolescent girls from low-income communities in Standard Chartered’s markets. By 2018 Goal has committed to equip 600,000 adolescent girls with the confidence, knowledge and skils they need to be integral economic leaders in their families, communities and societies. Prior to joining Standard Chartered, she was a Partner in McKinsey & Company’s Banking Practice. Before joining McKinsey in 2003, Anna was the CEO of a financial information company based in London. She started her career at D. E. Shaw, a New York-based investment firm. Anna holds an MBA from London Business School and an undergraduate degree from Northwestern University in Chicago. Anna is married with two children and lives in Singapore.